Home| What’s Standing In Your Way? You want to like yourself. You are sick and tired of feeling lonely, left behind, and insecure. You know you have things to feel proud of, but you just can’t stop thinking about all the ways you are not good enough. Take this quiz and learn about the mental junk that is keeping you from feeling like the confident badass you want to be. Yes, please. 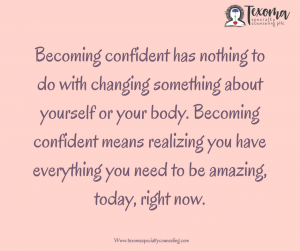 I'd like to receive further offers and promotions from Texoma Specialty Counseling.